Toxic first showed up during the Gang War as one of the many villains that spent the conflict as customers of the Freak Outpost bar. He remained with the Vicious Circle for years and was present during the raid on the White House when CyberFace was removed from power. He was injured during that battle but survived and later was part of an army assembled by Mako to take on Solar Man. 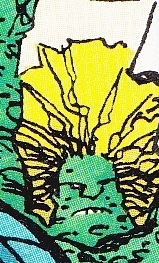 Toxic was one of the many victims of the death-dealing hero during the resulting massacre.